Applications - via the English Folk Dance and Song Society - are now open for 2017/18 - click here to find out more. 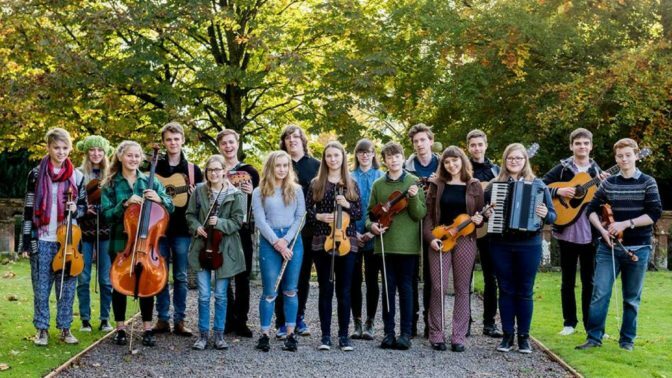 Now in its second year, we are delighted to welcome back what will be the second cohort of the National Youth Folk Ensemble for their Autumn Residential. The NYFE celebrates excellence in youth folk music, bringing together talented young folk musicians from across England to create and perform inspiring new arrangements of folk music and work with leading folk artists. The NYFE is an English Folk Dance and Song Society programme funded by Arts Council England. Membership is an annual commitment from October to August. The residential courses take place in the school holidays: October, February, Easter and summer. Applications are now open for 2017/18 – click here to find out more. Sampler Days are the first stage of the audition process; the first of these takes place at the Colston Hall in Bristol on Saturday 27 May with further dates across the country during the following week. The first cohort in 2016/17 received expert tuition and guidance from Sam Sweeney, Artistic Director 2016-17, and a team of leading folk artist-educators including Rob Harbron, Miranda Rutter, Saul Rose, Becky Price and Ben Nicholls. The 2017/18 team will be announced shortly. Visit the EFDSS website for updates.